The Samsung Q7FN QLED Smart 4K UHD TV is the 2018 version of the brand’s QLED TV 7-series. This TV is the successor of the Q7F QLED TV which was a popular TV model from Samsung in 2017. Today, we are going to take a closer look at the Samsung Q7FN QLED TV 2018. It’s predecessor, the 2017 Samsung Q7F QLED TV, was and still is a good well-rounded 4K UHD TV. Capable of performing well in almost every use-cases. QLED was the brand’s answer to OLED, enabling their TVs to produce vivid colours that are better than most TV. Its motion is excellent as well, and its input lag is among the best available out there for a TV. On closer look, it seems that the 2018 Samsung Q7FN QLED TV retained most of its features. However, it looks like the 2018 version of Q7 did not get much of an upgrade. 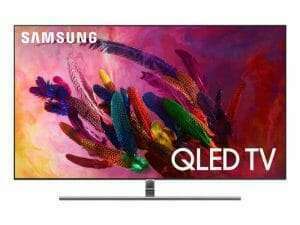 The Samsung Q7FN 2018 has a flat display that features their iconic Quantum Dot Colour technology, which is exclusive to the brands QLED TV models. It features a boundless 360 with clean back finish design. If we are to compare the design of the 2017 Q7F and the 2018 Q7FN, the changes are minimal. In terms of overall design, nothing much has been changed from Samsung’s 2017 Q7F to their 2018 Q7FN for the QLED 7-series. The only noticeable change is the design at the back which is minimal. The stand of the Q7FN is slightly smaller than the stand of Q7F. About 2mm smaller. Compared to its predecessor, the Q7FN has a rectangular back stand mounting attachment. The Q7F has a circular. Samsung calls this stand as “One Mount Solution”. QLED TV’s One Mount solution allow owners to place their Q7FN TVs wherever they want, however they want with a variety of stands that are easy-to-change. Another feature that was retained and is still one of the main features of this TV is the Samsung One Invisible Connection™. It’s a cable that combines power and video/audio signal into a single connection to the TV. This cable is then connected to a box that comes with the TV. It’s more like a one connect box or as Samsung called it, One Connect Box™. This box allows owners to connect different components to one separate box and not to the back of the TV. Giving them a good cable management option for that clean and neat cable-less setup. The Samsung Q7FN 2018 now comes with support for HDR10+. Its predecessor, the Q7F, did not have this feature and only had what Samsung called “HDR 1500“. The pictures produced by this TV are crispy, dynamic and with depth. Unlike the HDR1500, the HDR10+ doesn’t alter the fundamental character of the picture. Enabling this TV to produce the whitest elements and colours look brighter, while the blackest areas become more pronounced without causing the picture to look overblown or making it unrealistic. The picture quality of this TV is by far amazing. Very detailed, solid and vibrant vivid colours that draw you in more effectively the longer you view it. This is probably due to the brands Quantum Dot Display and Quantum Dot Colour. Combined with a 10bit panel, this TV is able to express an impressively wide range of colour shades. Creating a more realistic and accurate colour of picture reproduction. Viewing with HDR content is amazing. The Q7FN comes features the high-end picture processing processor of Samsung, the Q Engine. This enables the TV to further heighten the details and depth of the picture. Optimising the content for 4K clarity, colour and HDR. The Samsung Q7FN QLED TV (2018) features a 4.1CH 40W built-in speakers. The 2017 Q7F features the same speakers so this TV didn’t get much of an upgrade in this department. The sound quality and loudness produced by the Samsung Q7FN QLED (2018) are similar to most TVs with inbuilt 40W speakers. It’s not bad but not groundbreaking as well. In this case, a cheap soundbar can be an improvement when added. The Samsung Q7FN QLED TV (2018) is probably one of the best TVs for gaming. It has a refresh rate of 120 Hz that allows you to play your video games of up to 120 frames per second. Giving you an amazing smooth video game play with no screen tearing or ghosting. Though not all gaming systems are capable of making your favourite title run 120 frames per second on this TV. In terms of response time and input lag, this TV has 10ms of response time grey to grey and 19ms of input lag in game mode. That’s by far one of the best gaming performance with have seen on a TV. Making the Samsung Q7FN QLED one of the best and top choice TV for us in terms of gaming display. 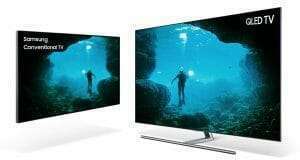 If you’re wondering about the difference or what upgrades or changes did the Samsung Q7FN QLED 7-Series 2018 4K UHD Smart TV got, here is a comparison between the Samsung Q7FN (2018) and the Samsung Q7F (2017). The Samsung Q7FN QLED 4K TV (2018) is the testament that the Q7 Flat QLED TV series is still one of the most popular TV on the market. Hands-down to its predecessor, the Q7F. A job well done that caused the brand to make a successor. The Samsung Q7FN QLED 4K TV (2018) is a seriously impressive TV, holding its own against OLED models with the same pricing. Its advantages significantly outweigh its flaws, and we are really super-impressed by the handling of brightness and colour of this TV. When it comes to picture quality, the Samsung Q7FN is definitely a treat. Though there are some lighting-related issues, for the most part, this TV offers new heights of HDR performance. However, if you find yourself far more concerned about the black uniformity and shadow detail of the display, then you’re better off with OLED TVs. Bezel-less with Clean Cable Design. Not Much Improvement Compared to its Predecessor Q7F 2017.